Dusk To Dawn #557 is a basic mountain cabin that is perfect for a couple or small family to getaway to Big Bear and relax. Located within a quiet but central neighborhood, this home offers the basic essentials needed, plus there is a nice fenced back yard with a deck and a private outdoor spa and charcoal BBQ for your full enjoyment. The clean and cozy living room offers comfy furnishings, knotty pine ceilings with a cool upstairs loft area, and a toasty fireplace (wood) and a TV/VCR for your entertainment. The modestly equipped kitchen has practical cooking essentials and basic appliances, while the dining area has table seating for six during meals, and there is a stack washer/dryer for your use. 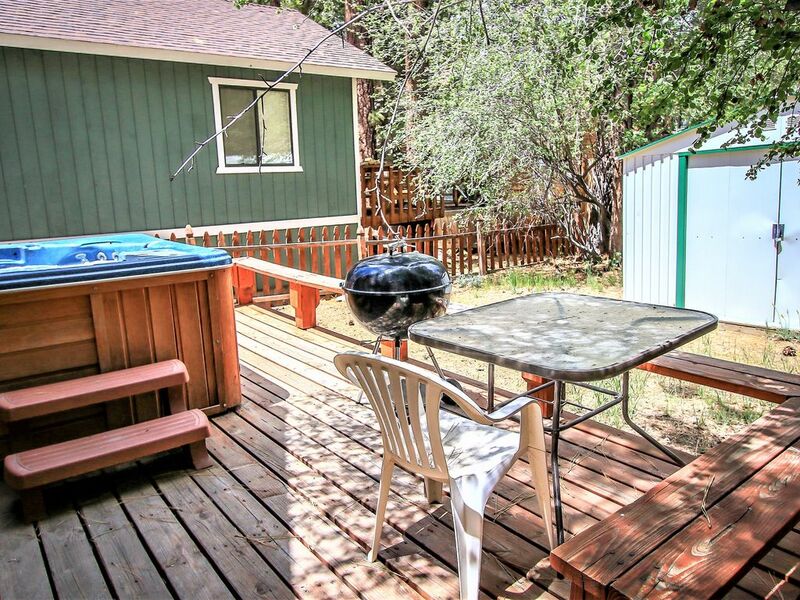 Dusk To Dawn is located within a short distance to the local zoo and golfing, plus minutes by car to all that Big Bear has to offer, this mountain cabin is the perfect home for your next getaway! The best aspect was the location so close to bear mountain. We walked to the moonridge lot and caught the shuttle up to the ski resort. I would say this cabin leaves a little to be desire on a vacation when spending so much money. It was freezing inside when we arrived and the place was difficult to warm up by heater. Everything was really old and could use some love. I got about 30 splinters in my hand by simple touching the front door. Could use some sanding and a fresh coat of paint. The wifi did not work which was annoying. The bed was only okay. The room is not much bigger than the bed. There was a portable heater which seemed 30 years old and made so much noise it was impossible to sleep and be warm. Upstairs is a loft with 2 twin beds overlooking the living room. This was my first experience with VRBO and it seems like Airbnb is a better option. Homes are cozier and you don't have to sign all these contracts like VRBO which is a hassle or go to the office to pick up the key. Thank you for sharing your voice. You are important to us! We appreciate your feedback and have shared it with the Team. We are always striving for greater excellence and seeing through the eyes of our Guests is very helpful! We will be addressing the concerns at this home ASAP. Please Note: In person Check in is a requirement according to City Ordinance. MY FAMILY LOVED THIS HOME. This home was very cozy. My family loved it. The spa was so nice to come home to after a long day in the snow. Can't wait to come back. What a wonderful review! Thank you so much. This is the level of excellence we strive for. Happy Vacationers making wonderful memories. It would be an honor to have you back sometime very soon.